FairFX is rated Excellent by over 5,000 customers on Trustpilot. 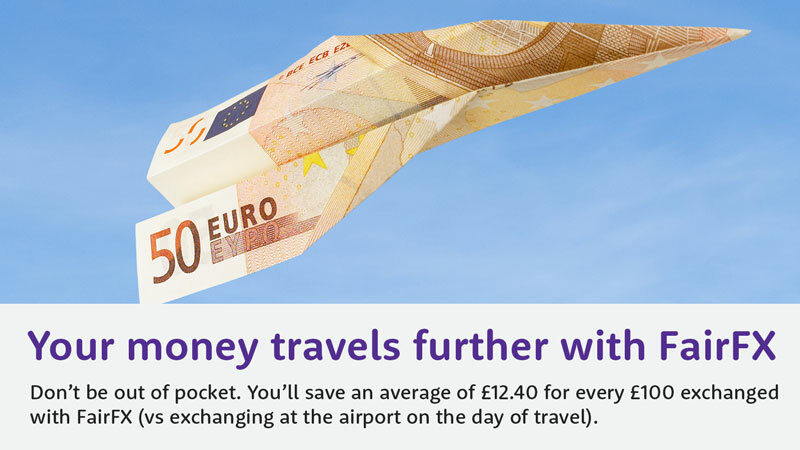 Get your travel cash from Holiday Extras in partnership with FairFX and get competitive rates from a long standing company that knows how to do customer service. FairFX's UK based Customer Service team are on hand 365 days a year and are happy to help with whatever you need. Get in touch via email on enquiries@fairfx.com or on Twitter at @fairfx. Travel money. We've all used it. Ventured out into the world to be greeted by countless different exchange rates in even more places, and all you can do is commit and hope you've got the best bang for your buck. Unlike banks and post offices, we bypass the hassle to get cold, hard travel cash delivered to your door, with just the click of a button. We have partnered with FairFX, an award-winning leading travel money provider offering you, not only high street beating exchange rates, but also next day delivery, even on a Saturday. We'll make your travel money go further, without you even needing to take a step out of your door. FairFX are a long-established company, with an excellent track record, so not only will you know your money is in safe hands, you can rest assured that you're not getting short-changed on your travel cash. Save money here, spend more there. Secure a great exchange rate online. Including US Dollars and Euros. Saturdays to suit your schedule. * Next working day delivery for orders received before 1pm on a working day. Free delivery for travel cash orders over £750. A £5 delivery charge applies to orders between £500 and £750, and a £7.50 charge for those below £500. *Comparison is based on spending £1,000 in Euros. All prices correct at time of writing, and are subject to change. When will I receive my travel money? Should you complete an order for a travel cash before 1:00pm, FairFX will ensure that the order is sent via Royal Mail Next Working Day delivery to be received the following working day. Royal Mail do not deliver on a Sunday but you can opt into our Saturday delivery service. To arrange a Saturday delivery you need to select this option during the order process online. Please ensure that the order is placed before 1:00pm on Friday to get the funds on the Saturday of the week you ordered. Otherwise the cash will be sent out for delivery the next Saturday. If you are not going to be in at the time of delivery the money will simply be returned to your nearest Royal Mail sorting office. Should this be the case Royal Mail will provide a "While You Were Out" card stating where you can collect your travel cash from. Orders over £7,500.00 may be delivered on consecutive days due to Royal Mail constraints. How can I order multiple currencies? Each currency purchase is processed individually. As such, multiple currencies need to be ordered separately. Each order below £750 will be subject to a delivery fee. Can my currency be delivered to an alternative address? We have to follow strict rules when it comes to sending travel cash and FairFX cards which means we can only the money to your UK residential address. If you are not going to be in at the time of delivery of travel cash the money will simply be returned to your nearest Royal Mail sorting office. Should this be the case Royal Mail will provide a "While You Were Out" card stating where you can collect your travel cash from. If you have ordered a card it can be expected to arrive in 3-5 working days and does not need to be signed for. Do I need a FairFX currency card to order Travel Cash? No. Travel Cash and the FairFX Currency Card are two separate services. How much is the delivery for travel cash? We offer free next working day delivery for travel cash orders over £750. A £5.00 delivery charge applies to orders between £500.00 and £750.00 and a £7.50 charge for those below £500.00. Saturday delivery is charged at £3.00 for orders over £750.00, £8.00 for orders between £500.00-£750.00, and £10.50 for orders below £500.00. The maximum order value for Saturday delivery is £7500.00. Orders received before 1:00pm on a Friday will be delivered the next day; orders received after 1:00pm will be delivered the following Saturday.